Action from the Under 18 PFA Cup tie between Peterborough Sports and Hempsted United which Sports won 7-0. 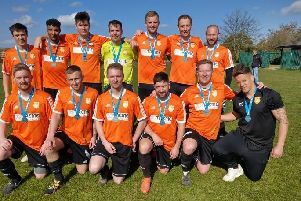 Goals came easy for two teams chasing promotion from Under 13 Division Four in the Peterborough Junior Alliance League. Hungate Rovers and Long Sutton Athletic joined FC Peterborough at the top of the table - all with 18 points - after chalking up emphatic victories on Sunday. More action from the Peterborough Sports v Hempsted United match. Long Sutton pummelled Parkside 13-0 while Hungate hammered Pinchbeck 9-0. FC Peterborough were without a game. Leading the way for Long Sutton on the scoresheet was Jak Turner with three while Jack Barron, Adam Crane, Layton Funnell and Kieron Wykes all fired doubles. Hungate also had a hat-trick hero in the shape of Sonny Wright and the rest of their goals came from Wyndell Barrett (2), Charles Pearce, Liam Simper, Bailey Smart and Tommi Smith. In Under 13 Division One, Yaxley were 3-0 winners against Feeder Soccer in the top-of-the-table clash. It was Feeder’s first defeat and Yaxley have now gone three points clear at the top with a 100 per cent record from six games. There was also a top-of-the-table clash in Under 13 Division Two where Wisbech St Mary beat rivals Orton Rangers 3-0. It was a day to forget for Wisbech St Mary at Under 12 level. In Division Three, Wisbech St Mary Yellow were bashed 18-1 by Bourne Town Claret, while in Division Four, Wisbech St Mary Purple lost 8-3 to March Town Athletic. Mason Baker, Shawn-Daniel Skelly and Erikas Tautrimas all notched twice for March. The top two teams in Under 12 Division One both dropped points. Leaders Feeder Soccer were held to a 1-1 draw by Deeping Clarets while second-placed Spalding Blue drew 2-2 at March Soccer School. There’s no stopping Under 14 Division One pacesetters Netherton United. They won 7-0 away at Holbeach with goals by Wayne Cort (2), Makomborero Gomba (2), Lukas Vaickelionis (2) and Jakub Nowicki to make it six wins on the trot and a three point lead at the summit. The Under 18 PFA Cup tie between Peterborough Sports and Hempsted United went according to form. Peterborough Youth League Division One table-toppers Sports ran out 7-0 winners against their Division Two opponents with goals by Ethan Atkins (3), Jordan Giddings (2) and Ayman Trabelsi (2). In Under 16 Division Three, Pinchbeck continued their impressive start to the season with a resounding victory over Stanground. They were 6-2 winners, making it three wins out of three, thanks to goals by Luca Ward (2), Michael McGowan, Joe Bull, Tom Thorold and Lee Addison. Their man-of-the-match was David Borkowski.